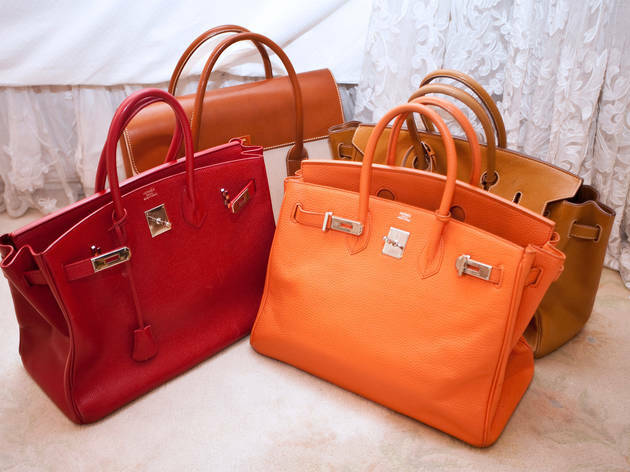 The legendary comedian fills her boudoir with fanciful baubles, basic black staples, and both real and fake Hermés bags. Photograph: Jolie RubenJoan Rivers (joan.co) isn't letting age slow her down: The 78-year-old wisecracking native New Yorker is busier than ever. 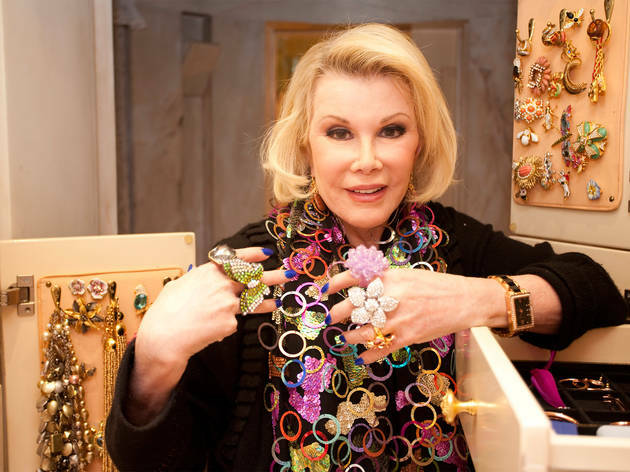 She performs stand-up all over the country, designs a fashion line, Joan Rivers Classic Collection, for QVC (qvc.com) and stars in two TV shows (Fashion Police on E!, Fridays 10pm, and Joan & Melissa: Joan Knows Best? on WE TV, Tuesdays 9pm). The veteran comedian converted her Upper East Side penthouse into an opulent Victorian-inspired abode. "I live in an old ballroom; people danced and had concerts here," she says. "My bedroom was the changing room for the orchestra." 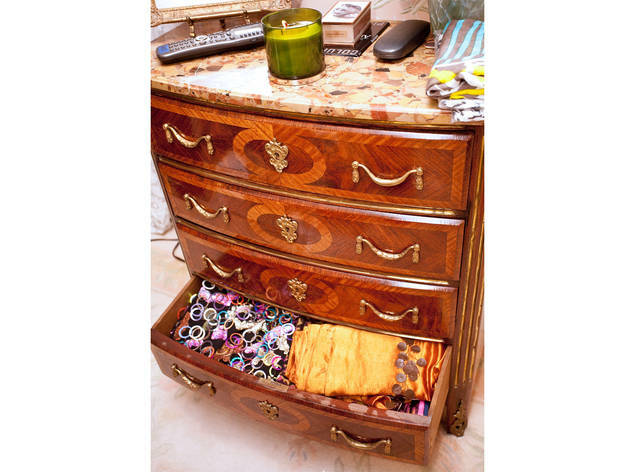 When Rivers designed her pad 20 years ago, she needed to get creative with storage. "Everywhere you look, something is hidden," she notes. 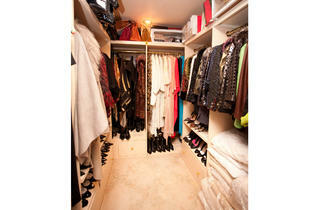 "I have things under tables, behind walls, and have multiple closets." 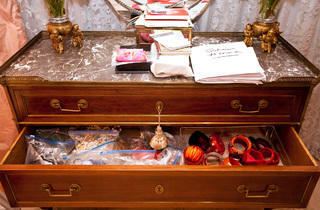 Photograph: Jolie Ruben"I am a hoarder," confesses Rivers. 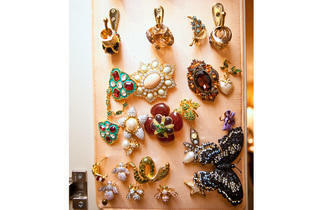 Luckily, she now splits her time between New York and L.A., which means half of her haul can be stored in California. 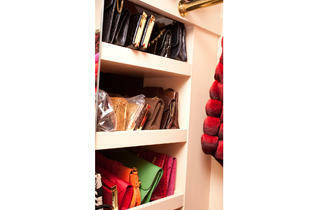 The performer stocks her neatly organized closet with a mix of high- and low-end wares. "I get great things at Bijoux Terner (bijouxterner.com) in the airports, where everything is $10." She insists she doesn't look at price tags and "it doesn't have to be a name" to earn a regular rotation in her wardrobe. She cites Topshop (478 Broadway between Broome and Grand Sts; 212-966-9555, topshop.com) as a favorite spot for fast fashion: "I love that it's the latest things---so it's going to break, who cares? By next year, no one is going to be wearing it anyway." Photograph: Jolie RubenWhen asked about dressing age-appropriate, declares Rivers, "hide as much as you can." She practices what she preaches by filling her wardrobe with interesting toppers. 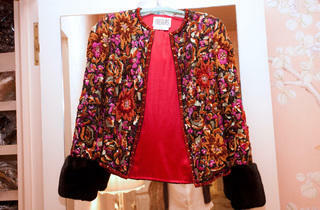 "A jacket is what makes the outfit---each one is an accessory," she muses. "I also have [a whole closet of just] fur, but it's all vintage. I figured if they were killed anyway, let them have a good time; I'm sorry they aren't coming back, so let them take a walk in Central Park." 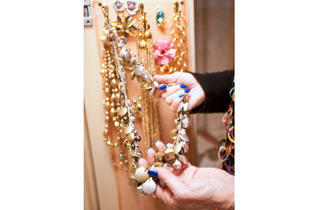 Photograph: Jolie RubenRivers keeps a rotating selection of her favorite baubles front and center in her closet. "My relationship with jewelry is that they are all my children, and like everybody else, you always like your new baby best," she says about her latest designs. Photograph: Jolie RubenRivers is an equal-opportunity shopper. 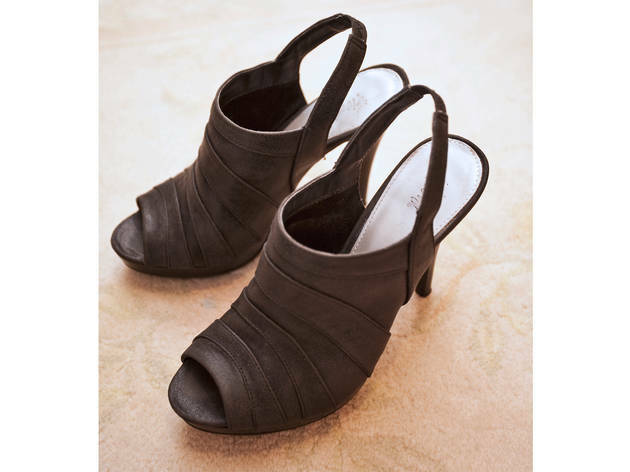 "My favorite, most comfortable shoes are from Payless," she says of her everyday slingbacks. 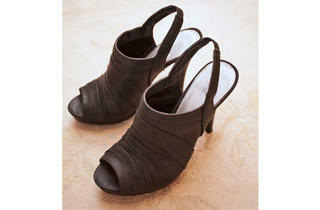 "I love Payless; you shop where the hookers shop, so you know [the shoes] will stand up [when] hitting the pavement." 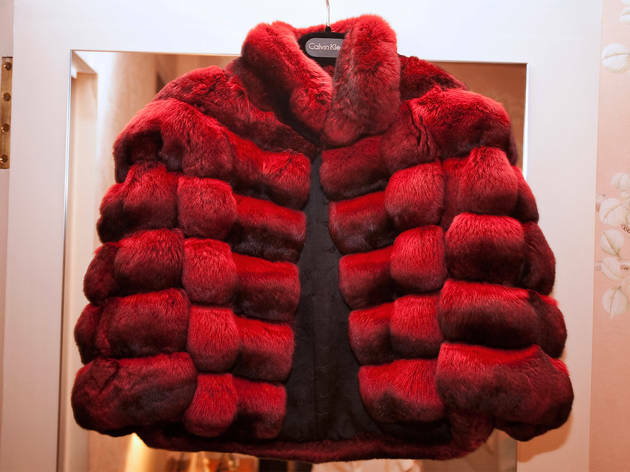 Photograph: Jolie Ruben"I'm sorry, I don't care how many chinchillas died; I just love it," states Rivers, referring to this Dennis Basso fur coat, which she wore to the Academy Awards four years ago. 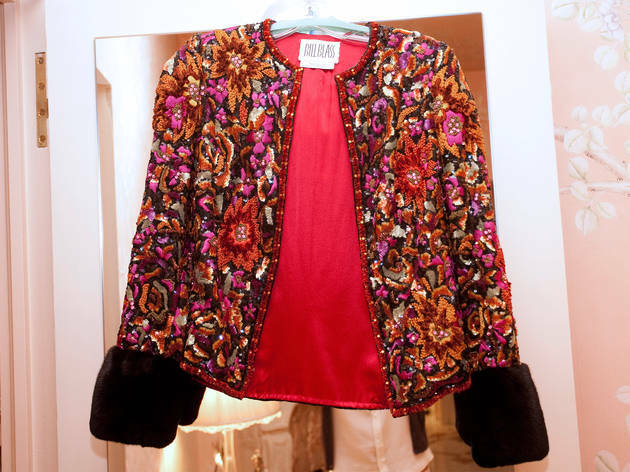 Photograph: Jolie Ruben"This is the kind of stuff I'm crazed for; it's one of the most beautiful things in my wardrobe," gushes Rivers, who wore this vintage Bill Blass jacket on episodes of Late Night with Jimmy Fallon, Fashion Police and her own reality show. "Now I wear it when I'm not going to be photographed." She picked up the sparkly stunner at a Las Vegas thrift shop. Photograph: Jolie Ruben"I love color, but I'm too fat to wear it, so instead I wear a bright happy scarf," jokes Rivers. She stands out in a custom-made wrap from William Ivey Long (williamiveylong.com). The theatrical costume designer creates all of Rivers's stage outfits, as well as special pieces she requests. "I have a pair of classic Chanel tuxedo pants that I've had copied for the last 25 years," she admits. Photograph: Jolie RubenA jewel-encrusted Judith Leiber (680 Madison Ave at 61st St; 212-223-2999, judithleiber.com) bag holds sentimental value. Rivers purchased the minaudire, which features the Chrysler and Empire State Buildings as well as the Twin Towers, in 1998. "I love New York, and just thought it was pretty," she notes. "After 9/11, I couldn't carry the bag for years because it used to make me cry," she admits. "It still makes me tear up now." Photograph: Jolie RubenThe performer wore this Donna Karan cardigan during a show she did in London three years ago. "It's short in the back and long in the front. Everyone is wearing these now," she says. "It's such a great color. People would come backstage [after the show] and, never mind whether they liked me, they wanted to know where my jacket was from." 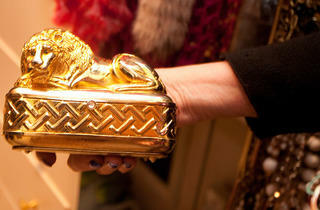 Photograph: Jolie Ruben"A lot of these are Joan Rivers [brand]," she says about her collection of bright clutches. "I design what I would like to wear, and because I'm often in all black, a colorful bag is great." Photograph: Jolie RubenA drawing from the late '20s of Rivers's mother lies next to a stack of everyday running shoes from New Balance and Nike. 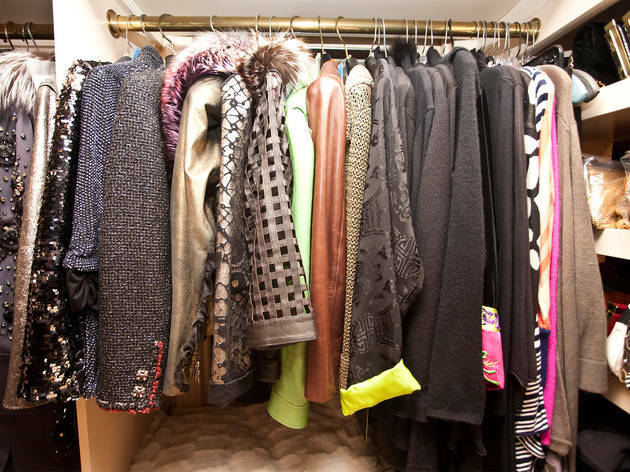 "It's just nice to have her in my closet," she says. Photograph: Jolie Ruben"I wore this to the MGM Grand Hotel in Vegas," says Rivers, referring to this gold Judith Leiber clutch. "Now it reminds me of the New York Public Library, so I wore it to a function there." Rivers has no qualms about repeating outfits. "I'm a great recycler," she says proudly. 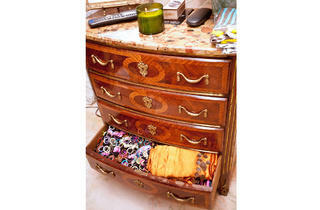 Photograph: Jolie RubenRivers stashes her overflowing collection of scarves in an antique bedside bureau. A pine-scented candle from God's Love We Deliver (glwd.org), a nonprofit Rivers often donates to (that serves nutritious food to those in need), sits atop the nightstand. "I buy enough for a whole year," she reveals. "I know it's a Christmas scent, but as a Jew, who cares---it all smells the same." 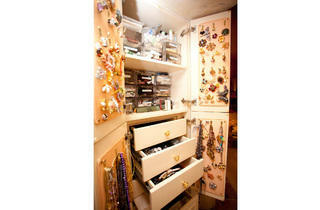 Photograph: Jolie RubenRivers took advantage of an unused space to create more storage. She used built-in cabinets and drawers to transform this hallway into an area devoted to her jewelry. 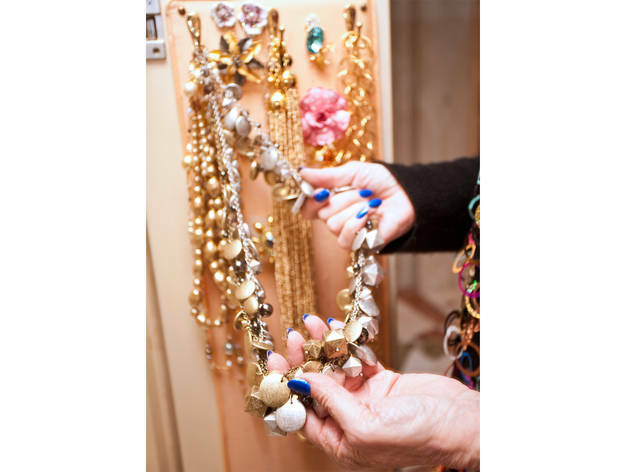 Photograph: Jolie Ruben"I'm really loving mixed metals and the very antique, broken looks right now," says Rivers holding up a piece from her QVC line. Photograph: Jolie RubenRivers insists on taking sartorial risks. "If you look stupid, you can take it off," she says. "Fashion should be fun, and anyone who takes it seriously is a fool---Anna Wintour." Her bright OPI Blue Lagoon polish complements her Joan Rivers baubles. 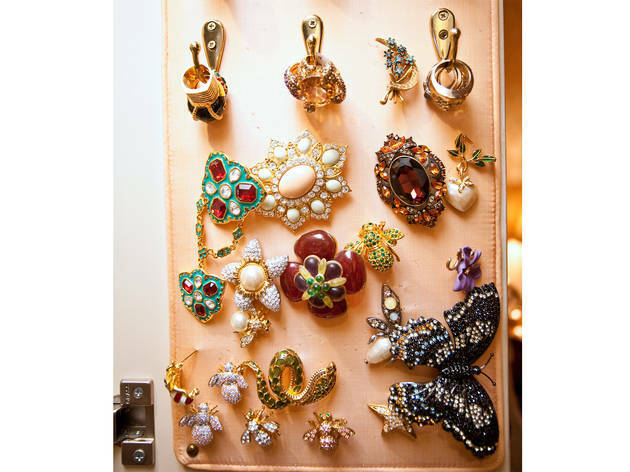 Photograph: Jolie Ruben"I have drawers and drawers of jewelry, and down in my basement, I have [more] trunks of jewelry," admits Rivers. "It's a 20-year business and I try to keep one of everything, but it gets crazy." 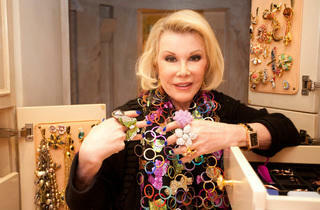 Photograph: Jolie Ruben"These are just fabulous---very bling-bling," she says of her affordable Joan Rivers's rings. "You can't get better than that for 10 bucks," she boasts. 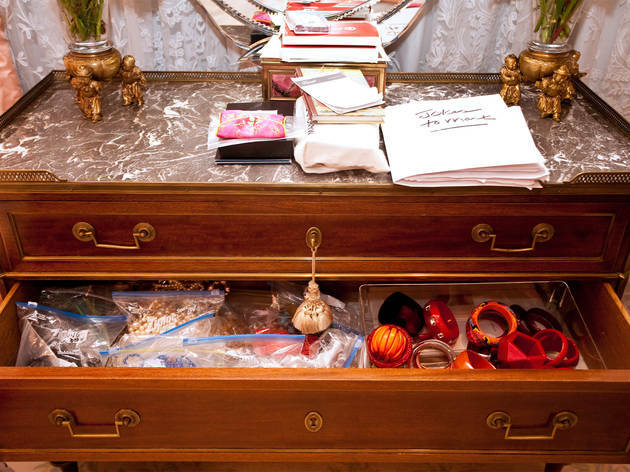 Photograph: Jolie RubenAn antique bedside dresser is also stuffed to the brim with jewels, some even stashed in Ziploc bags in an attempt to stay organized. "My personal style is like a basic canvas," she says. "It's all about accessories; that's the key." 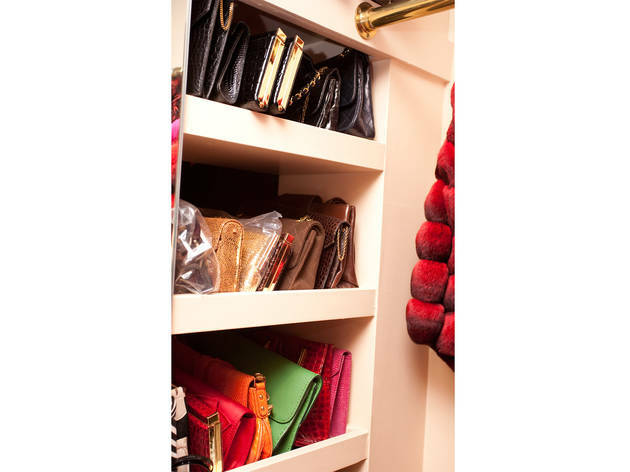 Photograph: Jolie RubenA wallpapered wall in a walkway just outside Rivers's bedroom slides opens to reveal her "dressier closet." Rivers admits that she buys her own gowns for red-carpet affairs. "I don't borrow because I don't have a good body, so right away it has to be altered---if you're going on the red carpet, it better be a good fit," she explains. "So Reem Acra or Carolina Herrera is not so thrilled when her dress comes back shortened to [fit] a midget. Then the only other people who can fit into it are Dr. Ruth or Patti LuPone." Photograph: Jolie Ruben"My stage costumes differ very little from my everyday going-out glitter [looks]," she says, holding up a custom-made William Ivey Long jacket. "If there's room for a sequin, I want it on there." 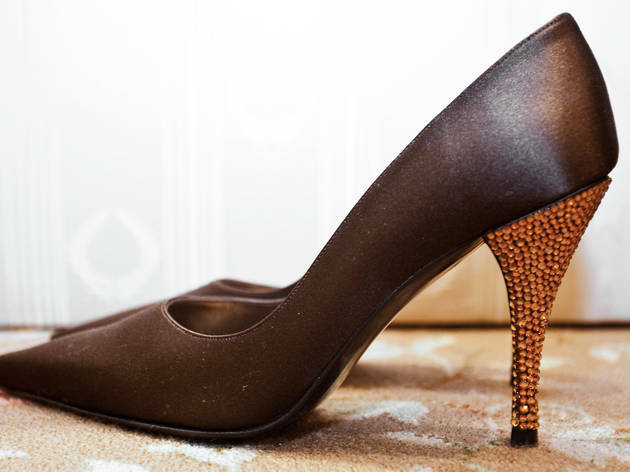 Photograph: Jolie RubenRivers wore these Stuart Weitzman satin pumps with bejeweled heels to Buckingham Palace. "I'm a guest of Prince Charles twice a year---usually," she says. 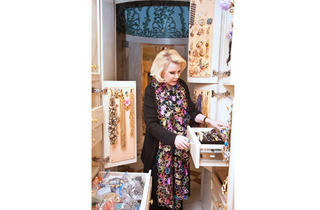 Photograph: Jolie Ruben"I am big shopper and I love finding bargains," boasts Rivers. Some of her best discoveries have been on the streets of New York. "These are Herms and Herms copies," she confides. 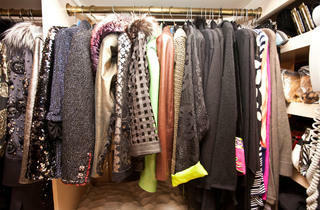 "I have no worries about which one I carry, so they are mixed in together [in my closet]." 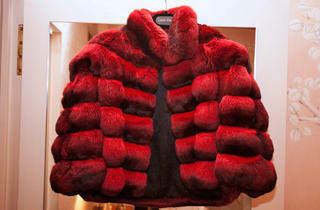 Photograph: Jolie Ruben"Melissa bought this [faux Herms] for me for the season two premiere [of Joan & Melissa]," recalls Rivers. 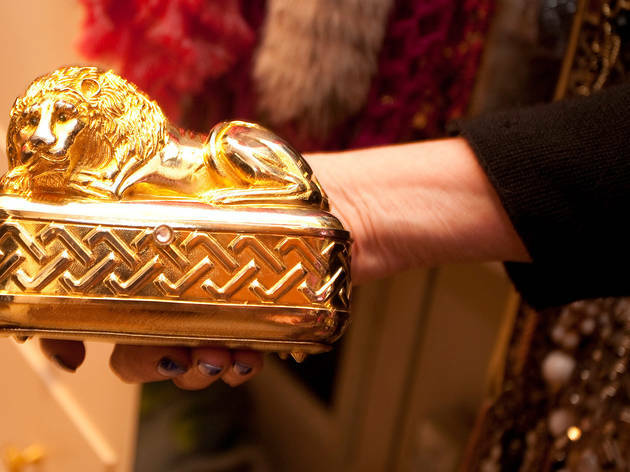 "I'm pretty sure it fell off a truck from New Jersey, but I love it anyway." "It's trendy, cutting-edge, and there's always something exciting and new happening," says Rivers. "I love Irwin Woislavsky, the optician there," enthuses Rivers. "He knows you, he likes you, and he gives you a piece of cake. Plus, he's got all the latest styles of sunglasses and glasses." 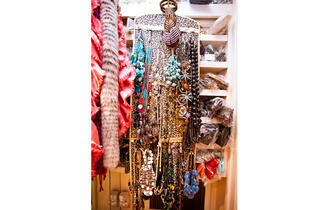 "I drool over the jewelry counter," says Rivers of this upscale accessories shop. "It has wonderfully unique pieces." "This is a go-to place for gifts," says Rivers. "I'll always find something. It's affordable WASP—copies of stuff you see in the Hamptons."